The Scandinavian countries are amongst the most prosperous nations in the world. Scandinavian society was experiencing change as regional kingdoms were beginning to replace the local chiefdoms. Scandinavian raiders and traders voyage far and wide in the great age of the Vikings. 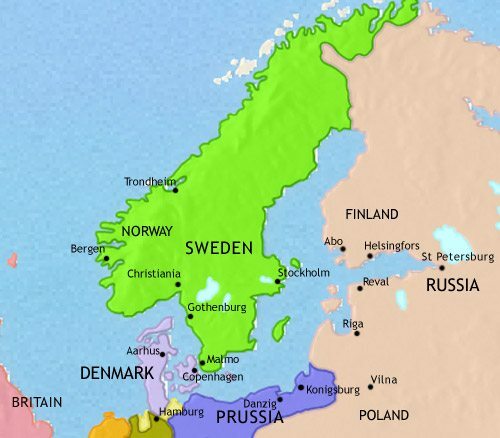 The Scandinavians have become Christians and are colonizing the Baltic coasts. 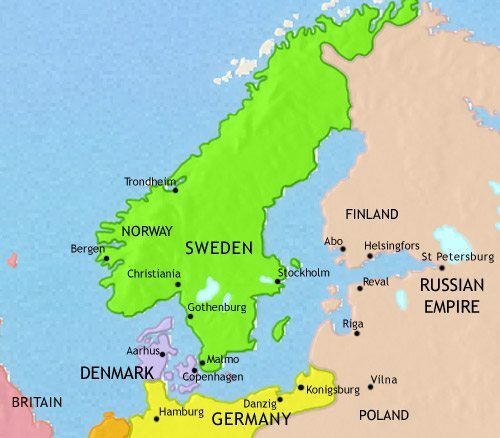 The kingdoms of Denmark, Norway and Sweden are all ruled by one monarch. Sweden has become a leading European power. Sweden has experienced decline as a European power. Norway is now under the control of Sweden. Denmark has experienced traumatic defeat at the hands of Prussia. Norway is now an independent nation. Finland has had to fight hard against Russia for its independence. The Scandinavian countries are amongst the most prosperous and stable democracies in the world. 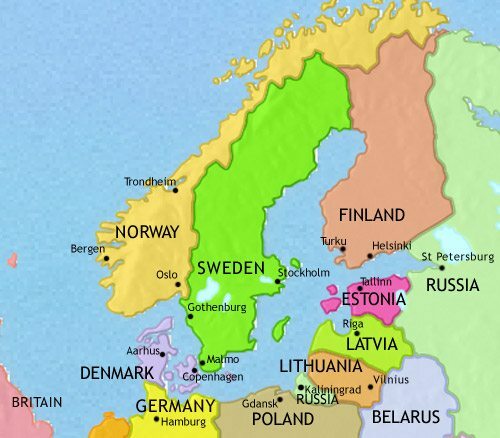 Denmark, Sweden and Finland are all members of the EU. Norway and Iceland remain outside, but, along with Denmark, are members of NATO. Scandinavia was a region in flux at this time. The hunter-gatherer and reindeer-herding Lapps were being pushed further north as Scandinavian farming communities spread northward. They carried with them a long tradition of seafaring; coastal routes had always been easier than the mountainous and swampy overland routes, and the well-sheltered coastal waters, fjords, lakes and navigable rivers meant that for thousands of years boats were the most important means of transport. The poverty of the soils in much of Scandinavia also encouraged fishing, seal hunting and sea-borne trade. Since 500, Scandinavian society seems to have become more militaristic, dominated by a warrior elite led by warlike chieftains. Fortified settlements multiplied across the region. By the 7th and 8th centuries, the chiefdoms were being amalgamated into regional kingdoms. 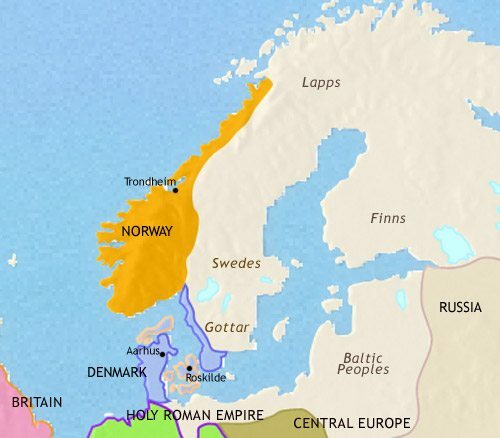 The most advanced of these kingdoms was that of the Danes, whose kings were powerful enough to have an earthwork barrier constructed right across the Jutland peninsula. 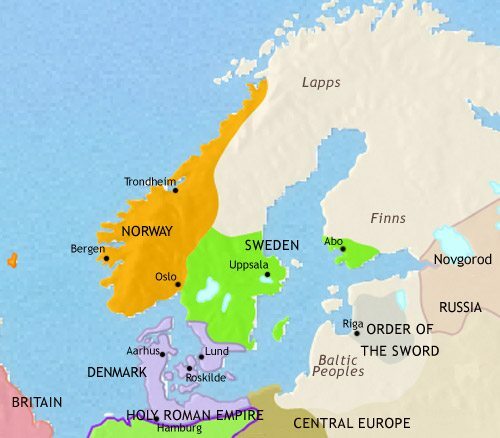 Elsewhere, the Swedes and the Gotar of present-day Sweden formed powerful kingdoms, and in Norway, the fragmented nature of the land encouraged the development of small independent kingdoms along the coast. The Scandinavians had had trade links with western Europe since at least Roman times, via the coastal routes along the North Sea. By this date also the Swedes were active as traders eastwards, along the Gulf of Finland, and had established a small trading colony on the banks of Lake Lagoda, just inland from the gulf. Political instability, coupled with a shortage of good land, has sent Scandinavian warriors raiding far and wide, in their small, seaworthy ships – this has been the great age of the Vikings, striking fear into millions of Europeans. Their raids, however, are followed by trading and settlement, especially in the British Isles and northern France – and in distant Iceland, where Norse sailors and farmers have established the oldest existing parliament in the world. 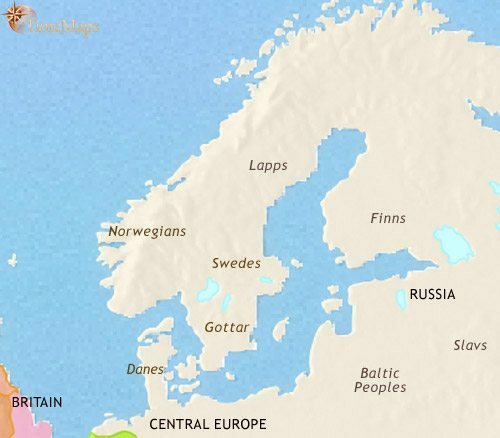 Another field of activity, especially for the Swedes, is the great river systems of Russia, where leaders of Scandinavian descent have founded the vast state of Rus. By this time, the Norwegians and Danes are forming themselves into kingdoms. The Danes have accepted Christianity, while the Norwegians remain mostly pagan. 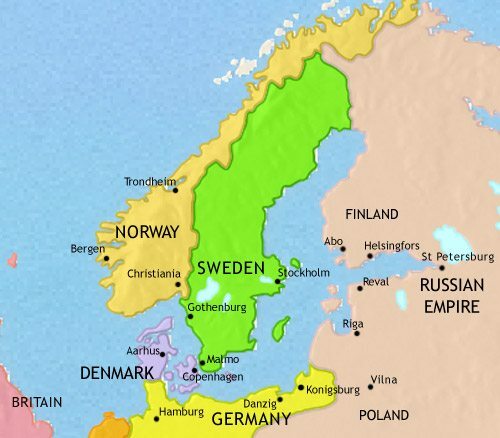 For a time, Scandinavia became the centre of an extensive empire, under King Cnut (reigned 1016-35), which included Norway, Denmark and England, but this swiftly disappeared after his death. 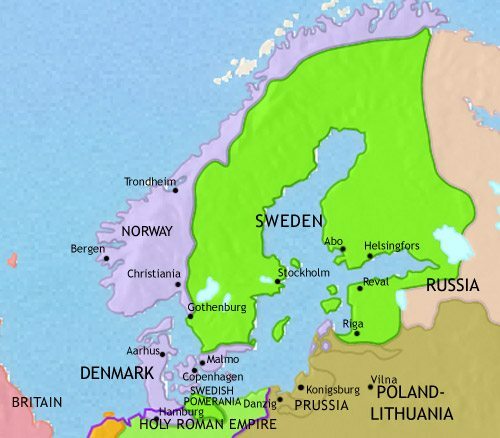 The Scandinavian kingdoms of Denmark, Norway and Sweden had all converted to Christianity by the late-12th century. Denmark, under Valdemar the Great (reigned 1157-1182), has extended its territory in northern Germany and the Baltic at the expense of pagan tribes such as the Wends. Also the Crusading Order of the Sword, consisting mostly of German and Danish knights, has conquered the Liv peoples, and Swedes have begun colonizing Finland. The Norwegian kings, on the other hand, have been pre-occupied with the challenge of bringing the scattered regional chiefdoms under firmer royal control. This has involved them in decades of warfare, from the 1130’s on. They have also been trying to establish their authority over the Norse settlements in Scotland and the Isle of Man. In the later 13th century a new force rose to become a power in the Baltic region. This was the Hanseatic League, a collection of trading towns which stretched from Novgorod in the east to London in the west, and was centred on the north German city of Lubeck. Through their co-operation they have risen to dominate the commerce of northern Europe. 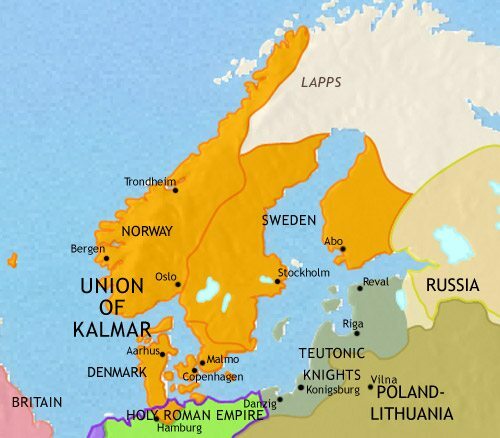 Partly in response to challenge posed by the Hanseatic league, the Scandinavian kingdoms of Denmark, Norway and Sweden, having all experienced political instability in the 14th century, came together in the Union of Kalmar in 1397. By the terms of this union, all three countries choose a single monarch to rule them all, but are otherwise more or less self-governing. Although each kingdom has a high degree of autonomy, there is constant friction between them, sometimes breaking out into open war. The Union of Kalmar between Denmark, Sweden and Norway, was characterised by repeated conflict. Eventually this Union was ended when Gustavus Vasa was elected king of Sweden in 1523. Norway remained united to Denmark. 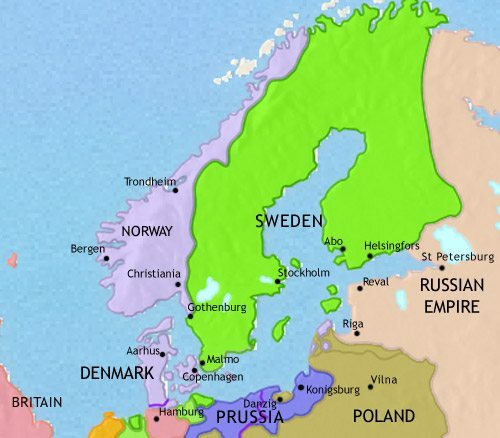 In the following decades all the Scandinavian nations became protestant. The Swedish and Danish kings seized all the Church lands and this strengthened the wealth and power of the crown. Under their charismatic king, Gustavus Adolphus (reigned 1611-32), and largely as a result of their victories in the Thirty Years War, the Swedes won important territories in the east, and on the southern shores of the Baltic. Just as importantly, the reign of Gustavus Adolphus – and the policies of his great minister, Oxenstierna – saw sweeping reforms that have greatly strengthened the nation’s power. The army, navy, civil service, local government, law courts and education have all been overhauled, making Sweden the most efficiently run country in Europe. Denmark, meanwhile, has benefited from the strong and effective rule of one of her most popular kings, Christian IV (1588-1648). He has paid great attention to the economy, carried out many centralizing reforms, endowed his capital with many beautiful buildings and founded several important new towns (including the later city of Oslo). He has also given Norway much greater autonomy. His foreign policy has been disastrous, however, drawing on his country the wrath of virtually all his neighbours, leading to two major invasions by hostile armies. Sweden’s Baltic empire aroused the envy of her neighbours, who joined forces to take it off her in the Great Northern War (1700-21). The high quality of the Swedish army and the brilliant generalship of her king, Charles XII (reigned 1697-1718), was not enough to make up for her lack of resources. She lost all her overseas possessions except Finland. Having abandoned her expansionist policies after 1721, Sweden also abandoned the absolutist form of government which underpinned them. She became a constitutional monarchy, governed by the Estates (Parliament). This ushered in a period of commercial and industrial expansion, but a period of political instability led to the seizure of power by the king, Gustavus III (1771). After humiliation at the hands of Sweden in the war of 1658-60, Denmark became an absolute monarchy under Frederick III (reigned 1648-1670) and his successors. The early 18th century saw a period of enlightened rule by Frederick IV, (reigned 1699-1730) and a group of reform-minded ministers. This was a period of widespread land reform and increased freedom for the peasantry. Since then, Denmark and Norway have been efficiently governed by capable ministers and an effective bureaucracy, even though several of the kings have been incapable rulers. The Napoleonic Wars were difficult for Sweden, at the end of which it lost Finland but gained Norway. Oddly, the Swedes finished the war with one of Napoleon’s marshals, Bernadotte, in control of the country. First as Crown Prince and then as king (1818-44), Bernadotte has been a conservative and unpopular ruler. The Norwegians only accepted the transfer of their country to Sweden on condition that their own constitution remained in force. This is, in fact, a great deal more liberal than Sweden’s, and has acted as a spur to Swedish liberals. The Napoleonic Wars were devastating for Denmark, as she sided with Napoleon to the very end. In the 1815 settlement, she lost Norway. She does, however, retain Iceland and Greenland. The end of the Napoleonic Wars saw Finland transferred from Swedish to Russian control. However, it is ruled as an autonomous Grand Duchy (with the Tsar as Grand Duke). It therefore has a very large measure of autonomy, keeping its own government institutions. Liberal governments have governed Sweden since the 1840’s, leading to reform and modernisation. Norway has also been under liberal government. The 19th century has seen Norwegian commerce and shipping develop rapidly, and Norway has become a leading force in world maritime trade. In Denmark, the government bowed to the growing liberal movement in 1848 and abolished the absolutist monarchy. It adopted a constitutional government, giving a key role to a Parliament and securing freedom of the press. In the wake of her defeat by Prussia in 1864, Denmark has had to give up her centuries-long control of Schleswig and Holstein. This traumatic defeat has led to the dominance of a conservative government, which will continue till the end of the century. It also led to the expansion of agriculture into previously waste lands, and to the rise of the co-operative movement in agriculture, as part of a wholesale shift to dairy farming. Both Sweden and Denmark are constitutional monarchies, with full power vested in their parliaments. Denmark has seen the rise of a highly influential cooperative movement, which has organized Danish agriculture along cooperative lines, and has experienced a high degree of industrialization. Sweden’s industrialization has lagged behind somewhat, and its economy has remained largely agricultural. This has made it difficult to feed its growing population, a problem alleviated by mass emigration to the USA. In 1905 Norway gained its independence from Sweden, and invited a Danish prince to become their king – Haakon VII. Norwegian international trade and shipping have been growing apace at this time; Norway has in fact one of the largest merchant shipping fleets in the world. As a by-product of the Russian Revolution, Finland became an independent nation in 1917. She then became the scene of civil war between the pro-Russian Red Guards and the White Army, under General Mannerheim. The White Army won, and Finland adopted a democratic, Republican constitution under the Presidency of Mannerheim. The country suffered greatly during the World War 2, valiantly fighting off a massive Soviet invasion, but she lost much of her eastern territory. In both Denmark and Sweden, the Great Depression brought social democratic parties to the fore, and in both countries a comprehensive welfare state began to be put in place. 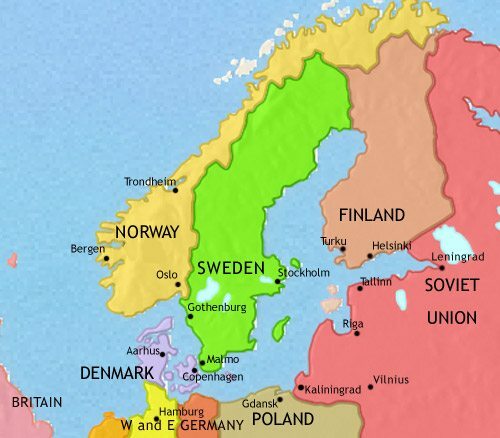 Denmark and Norway were occupied by the Germans during World War 2, whilst Sweden remained neutral. The close relationship between Danes and Swedes allowed one of the most remarkable events of World War 2 to take place. On one night in October, 1943, in response to Adolf Hitler’s order to arrest and deport all Jews in Denmark, the Danes and Swedes jointly arranged for the Danish Jews to be evacuated across the straits to Sweden. In this way, 99% of Jews living in Denmark were saved from the death camps. During World War 2, Iceland, for centuries a dependency of, first Norway (1262-1380), then Denmark (from 1380) became a fully independent republic (1944).